Two Merlin miniature jugs - 1⅞" (47 mm) high. 1960s. Norman Benjamin Bridges's family were associated with the Dicker right back to Benjamin William Henry Bridges who owned Boship Pottery when it amalgamated with Dicker to form Uriah Clark and Nephew. Norman worked for many years at the Dicker as a thrower, and after its closure went to work with Keith and Fiona Richardson at Brickhurst Pottery and stayed with them for seven years. 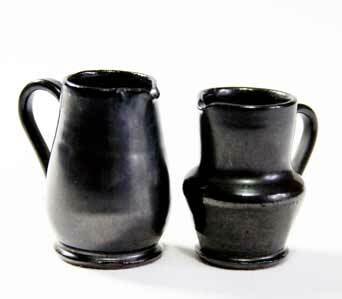 In 1963 he left to form Merlin Pottery, where he made similar wares with the familiar black metallic glaze. The pottery closed in 1970.